This set of Concrete Technology Multiple Choice Questions & Answers (MCQs) focuses on “Factors Affecting PIC, Cold Weather Concreting”. Explanation: It was recommend by the scientist later on that the moisture content of the aggregates shall not exceed from .1% to .5%. 2. Which one is not the polymeric resin? Explanation: Polymeric resins that are commonly used in polymer concrete are methacrylate, polyester resin, epoxy resin, vinyl ester resin, and furan resins. Explanation: Higher resin dosage is recommended when using fine aggregate, because of the presence of the large surface area of the materials. 4. Steel fibers helps in the enhancement of its properties. True or False? Explanation: Steel fibers, glass fibers, carbon fibers, and polyester fibers have been added to in PIC for enhancement of its properties. Explanation: Most of the studies have reported the addition of glass fibers are in the range of 0-6% in PIC. 6. Concrete is not recommended to be placed at a temperature below __________oC. Explanation: Any concreting operation done at a temperature below 50oC is termed as cold weather concreting. Explanation: IS: 7861 part-1 deals with hot weather concreting and Part-2 deals with cold weather concreting. 8. Why the time period for removal of form work has to be increased. Explanation: When the temperature is falling to about 50C or below, the development of strength of concrete is retarded compared with development at normal temperature. Thus, the time period for removal of form work has to be increased. Explanation: If concrete is exposed to repeated freezing and -thawing after final set and during the hardening period, the final qualities of the concrete may also be impaired. Explanation: Large temperature differentials within the concrete member may promote cracking and affect its durability adversely. Explanation: When the concrete in fresh stage is exposed to freeze before certain prehardening period, concrete may suffer loss in its prop. to an extent that compressive strength may get decreased to 50%. 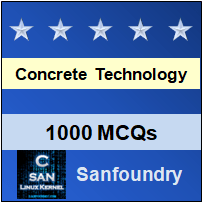 To practice advanced questions and answers on all areas of Concrete Technology, here is complete set of 1000+ Multiple Choice Questions and Answers.